Ask an Agent - our travel consultants are itching to help you find the cheapest flight deal from Durban. check what the cheapest price is which the flight price comparison engine on the left provides you, and book it. use our unique travel voucher system to further discount your flight from Durban. We encourage our readers to become our writers, and give away travel vouchers to anybody who emails us a flight & trip report. 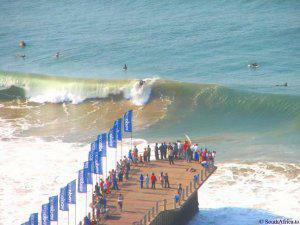 People leaving Durban is staying very low! The number of passengers on flights from Durban in April 2014 was only 3% higer than in April 2013. Don't want to fly? Try a cruise from Durban. We offer regular cruises from Durban on the MSC Sinfonia & MSC Opera cruise ships. Flights from Durban are operated from King Shaka International Airport which is situated north of Durban (previously they were flown from Durban International Airport, situated south of Durban).